Minority councils in the North East want direct funding but will that really help them develop? Funds may not be the problem. How they are used is more important. A solitary doctor mans the only public health centre for 81 villages scattered along a 12-kilometre-wide and 140-kilometre-long ribbon of hilly terrain that makes up the Chakma Autonomous District Council. Trained in Ayush, the non-allopathic stream of medicine, Lauva Chakma, the young doctor, can administer only basic drugs and first aid. There is no electricity at the centre – it is yet to be connected to the power grid. “We are only running an OPD [out-patient department]," said Chakma. "We cannot keep patients overnight.” In his thirties, Chakma studied medicine in Bangalore before taking up a job in Mizoram. He said he had not received his salary for three months. In the capital, Chwangte, the community health centre, which provides hospital care to about 50,000 people, things are not much better. The hospital has 20 beds, four nurses and two doctors, one of whom is a homeopath. In contrast, said Vanlallawma Khiangte, the medical officer at the hospital, an equivalent centre in Khazawl, a similar-sized town in Mizoram's Champhai district, has 30 beds, 11 nurses, four doctors, a dentist, in addition to an Ayush practitioner. The Chakma Autonomous District Council was formed in 1972 to address the development needs of the Buddhist tribal community, which is one of the ethnic minorities in the state. But on parameter after parameter, the council fares worse than other parts of Mizoram. This isn't unique to the Chakma council. As a previous story reported, even the Lai and Mara councils are faring poorly. There is little development spending. Villages here, reached only on rutted roads that are all but impassable once the rains come, have little electricity, ramshackle schools and distant healthcare. This shows up starkly in human development indices like the maternal mortality rate. In Mizoram, for every 100,000 live births, 76 women die. In Lawngtlai, which houses the Chakma and Lai councils, the maternal mortality rate is three times higher at 248. Such poor outcomes are surprising given the councils were created to give the tribal minorities in Mizoram – small groups with distinct cultures – greater control over the management of their region. The council leaders blame the Mizoram government. “The MLAs and the Chief Minister, they are all Mizos, and so they are not liberal in giving us money," said Hmunhre Chinzah, vice-chairman of the Lai Council's Planning Board. In Aizawl, the state capital, the Mizo leaders blame the councils. “The councils misuse the money they get,” said JV Hluna, the head of the history department in Aizawl's Pachhunga University and the chairman of the Bharatiya Janata Party's Mizoram unit. The lobbying has gained strength after the Bharatiya Janata Party came to power. The party is considering their requests. Ranjit Majumdar, the party official in charge of the North East, confirmed that a draft amendment has been prepared to the sixth schedule of the Constitution, which relates to the tribal areas of four states in the region. While the party is yet to take a final call on the amendment, he said, the draft enables direct funding. In all this lobbying, a fundamental question has not received much attention: Will direct funding improve the lives of people living in these councils? The importance of this question goes beyond these three councils. India's North East has 17 autonomous councils. If direct funding is granted to one, the rest will want it as well. For that reason, the Centre needs to be sure that direct funding will address the developmental deficit in these areas. But to start with, do the problems really stem from low funding? However, such claims don't reveal the whole picture. While the council implements welfare programmes, so does the state administration. This means more development money is spent in the council areas than the budget separately allocated to the council administration. 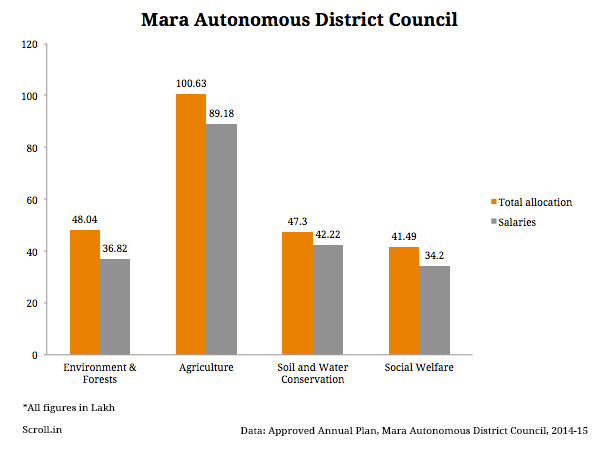 For instance, while the Mara council earmarked Rs 202 lakhs for rural development in 2014-'15, documents from the state administration's rural development department showed Rs 768 lakh were spent in Saiha on just one scheme – the Mahatma Gandhi National Rural Employment Guarantee Scheme. But the councils aren't pleased with this spending. 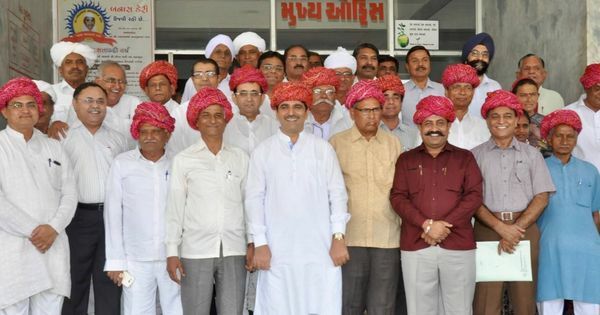 The leaders claim that the pacts signed at the time of the councils' creation envisioned the state's withdrawal from governance in the council areas. “The DC [district collector] and the SP [superintendent of police] are only supposed to look after law and order,” said Hmunhre. And so, the councils have been demanding that the state's implementation mechanism be dismantled and its funds rerouted to them. The draft amendment prepared by the BJP, said Majumdar, permits the councils to have an administrative structure similar to the state, which suggests they would be fully in charge of all development works in their areas. But is it a good thing to give the councils complete financial and administrative autonomy? The answer to that question perhaps lies in how the councils use the money they get right now. Scroll leafed through the annual plans of the Mara council and the budget of the Lai council. In both, an overwhelming proportion of the council budget went into salaries, as the chart shows. In Maraland, the total disbursement for 2014-'15 stood at Rs 114.50 crore. Of this, Rs 80.91 crore went into salaries. Apart from salaries, there is also administrative expenses. Add that and the amount allotted to actual developmental work falls some more. Take the Animal Husbandry and Veterinary department in the Mara council. Of its Rs 41.62 lakh allocation, it spent Rs 34.25 on salaries and wages and another Rs 3 lakh on administrative expenses, which left it with about Rs 4 lakh. Of this, just Rs 50,000 was spent on medicines – in a department meant for animal care and veterinary science. 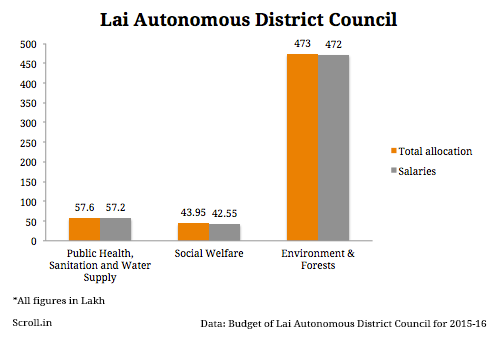 The 2015-'16 budget of the Lai Autonomous District Council reveals similar trends. Here too, so much gets spent on salaries that there is little left for actual developmental work. Even plan funds –marked for development work – are being used for salaries. The education department, for instance, should use plan funds to buy books or build schools. But in the Lai council, of Rs 808 lakh plan allocation for education, Rs 793 lakh was spent on salaries. Why is the expenditure on salaries so high? To come to power, local politicians “promise jobs and contracts to supporters", claimed a local businessman, who requested anonymity. The reason why people change their political affiliations so easily is because getting a party membership is often the only way to access government benefits. In the Chakma council, returns from the old occupations like jhum farming are falling. “Thirty years ago, if people planted one tin [about 16 kilos] of paddy, they would get 100 tins as harvest," said Jyotirmoy Chakma, the president of the Central Young Chakma Association. "This is now down to five-six tins. That is enough for just one or two months." Shanti Jiban Chakma is the BJP's president in the Chakma council area. It isn't difficult to see how the political system operates in the councils. These are backward areas with little economic activity. For the local elite, the easiest way to power and affluence is to get into the council. “The leaders speak on behalf of the people but these demands are ultimately in the interests of only the ruling elite,” said N William Singh, a professor of Sociology at Pachhunga University College. This competitive politics undermines the benefits of those living in the councils. But the leaders are able to escape scrutiny by shifting the blame to the state government and telling the locals that the Mizos are not giving enough money. What makes it possible for them to get away with such characterisations is that the state administration, dominated by Mizos, does indeed neglect the councils. But the neglect does not show up in the distribution of funds. It takes other forms. The state administration continues to exercise some control over the recruitment, appointments and postings in the council areas. In the Chakma council area, the hospital at Chawngte is supposed to have a senior medical officer working along with Khiangte, the sole MBBS at the centre. While a doctor has been appointed, he rarely reports for duty. People said the state administration doesn't penalise doctors who do not want to serve in the Chakma areas. A similar pattern is visible in educational institutions. Beyond higher secondary, the local school and college in the Chakma council area only have teachers for arts. Students wanting to study science and commerce have to move to Aizawl, Silchar or Lunglei. But studying outside is expensive. So most students drop out after class 10, said Shanti Chakma, the BJP's local president. “If we get a college for science here, then the Chakmas will overtake the Mizos,” said Deepak Larma, a resident of Boranpansury, the village with the sole primary health centre in the Chakma council area. "As it is, we are Buddhists, not Christians, and so they want to keep us backward." Larma and his friends were playing cards under a tree. A heavy-set man wearing shorts and a black undershirt, Larma used to work for the Border Security Force. After leaving the force, Larma, a Chakma, has settled in Boranpansury, and like many young people, believes the Mizos are limiting the opportunities available to the state's ethnic minorities. This perception got a boost in April, when another instance of bias surfaced. The state government amended the rules for its technical entrance exams that determine the selection of candidates for courses like engineering, medicine, nursing and veterinary science. Mizoram categorises applicants into three categories: local permanent residents get 85% of the seats, migrants from elsewhere who have settled in Mizoram get 10%, and those working in the central or state administration and residing in the state get 5%. Through the amendment, Mizoram has restricted the definition of “local permanent residents” to only “Zo-ethnic people who are native inhabitants... and have been residing permanently in the state”. Noting that Zo-ethnic refers only to the Mizos, Chakma organisations protested this would exclude them from the bulk of seats. A statement from the Mizoram Chakma Students’ Union described the amendment as discrimination against the minority communities of Mizoram, including the Chakmas. Such steps keep the identity issue boiling and distract attention from the mismanagement and corruption in the council areas. The conventional wisdom that the state administration is hostile to minorities might have considerable truth, but it has allowed local administrations, comprising the elite of these minority groups, to become predators on its own people. For instance, though the Mara council is cash strapped, that has not stopped it from building a sprawling bungalow in Saiha as the residence of the Chief Executive Member. The under-construction bungalow towers above the homes in Saiha.